The peculiar institution of slavery in Rhode Island had its start and evolution with the sea. The town of Newport, aptly named the “City by the Sea,” would become the fifth most active seaport in all of Thirteen Colonies by the mid-18th century, an era that historians refer to as the “Golden Age.” At this time Newport would lead Colonial America in the participation in the notorious Trans-Atlantic Slave Trade. In fact, between 1705 and 1805, Rhode Island merchants sponsored at least 1,000 slaving voyages to West Africa and carried over 100,000 slaves back to America. While Newport, and New England in general, would provide some level of training, education and somewhat more humane treatment for enslaved Africans as compared to the southern Colonies and West Indies, there were many slaves that choose the path to freedom as runaways. In reviewing runaway slave advertisements of the time, there are a significant number of slaves who escaped from one slave community to “hide in plain sight” within another slave center. This logical action found slaves fleeing from a New York or Boston to live relatively free lives within the large community of color in a community such as Newport, and vice-versa. Historical records also indicate runaways are many times relocating to urban seaport communities where they become part of a crew on privateers and whalers. 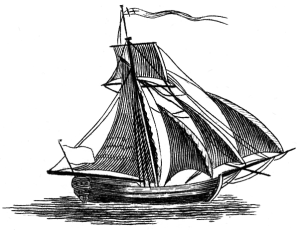 This act is seen frequently in advertisements with the statement, “All Captains of Vessels, and others are forbid harbouring, trusting, or carrying away said Runaway.” At that time, the demanding and highly dangerous work on the sea afforded the African one of the few vocations where he could work, make reasonable wages and live a life blending into the egalitarian environment as part of the highly eclectic sailing crew. In his award winning book, “Black Jacks: African American Seamen in the Age of Sail,” author W. Jeffery Bolster points out that seafaring was one of the most significant occupations among both enslaved and free black men in the 17th and 18th centuries. Free African John Quamino of Newport, originally from coastal town of Annamaboe in Ghana, would be killed at sea serving on board an American privateer in the Battle of Block Island during the early days of the American Revolution. Later, at the outbreak of the War of 1812 free African Hannibal Collins enlisted in the naval forces and served under fellow Newporter Commodore Oliver Hazard Perry in the famous Battle of Lake Erie. After the war he would return to Newport and become an active member of the Colored Union Congregational Church. Slave or free, Africans through their keen intellect and creative survival skills found many paths to living productive and fulfilling lives despite the harsh restrictions of the slave institution. And in Rhode Island, one of the best paths to freedom and prosperity lead to the sea. This entry was posted in Occupations, Research, Uncategorized by Keith Stokes. Bookmark the permalink. Newport Gardner’s grandson served on the USS Constitution. At your earliest time, please contact us concerning the most recent current events Also, where and are there any monthly meetings?